Have you seen the work I have been doing with the local primary schools? If you have that’s FANTASTIC! If you haven’t…it’s not the end of the world…you can update yourself by having a search through my blog or my facebook page! City Wide we have an ongoing issue with Parking during school times. We have limited parking available for those parents/carers who are unable to walk their children to school. I have been working with Gunthorpe Primary School, Welbourne Primary School and last but not least Norwood Primary School to try and tackle these issues since November 2016. Unfortunately some motorists deem it necessary to put convenience before the law but most importantly the CHILDREN. It is extremely important that we park safely with the Children in mind at all times! 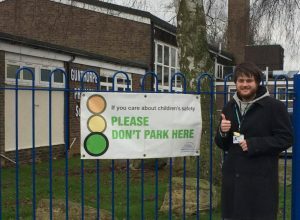 Welbourne Primary School was provided with a #SaferParkingBanner as you may have seen in my previous posts. It was due to be returned however it has been loaned out for a longer period due to the high need for it. The Prevention and Enforcement Service Officer (Road Safety) attended the school for an event on the 16th and 17th of February to work alongside some of the children; handing out parking and seatbelt leaflets to parents. This was a fantastic event and it was great for the older students to get involved. The officer reported that “These were generally well received”. The Prevention and Enforcement Officers were also in attendance for this event and have and will continue to make regular visits. (Who deal with illegal Parking). 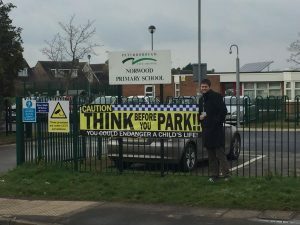 Gunthorpe Primary School was also provided with a Green #SaferParkingBanner as you may have seen in my previous posts. Again it was due to be returned however it has been loaned out for a longer period due to the high need for it. The Prevention and Enforcement Service Officer (Road Safety) has also been in close contact with Gunthorpe Primary School. She was in attendance giving drivers advice regarding parking safely and seat belts. During this visit one ticket was given out. We are in the process of organising a similar parking event to the one at Welbourne, where the children will be involved and also the site manager. The Parking Officers have been and will continue to be present during these events and will continue to make visits in the meantime and after these events commence. The Site Manager has also volunteered to deliver various road safety packages to the Children in the Coming Months. Following my request for more parking banners to be ordered at the Full Council Meeting; this has been put in place. Therefore once they are received Norwood will also receive a green banner. Norwood also have a THINK BEFORE YOU PARK! Banner; which can be seen from Coniston Road and Gunthorpe Road. A Similar Parking event will be ran in due course. Safety Officers will continue to be in attendance regularly. There have been many concerns raised by Residents, Parents and Carers during this time. I have addressed all concerns individually and I will endeavour to update everyone as soon as a response is given from PCC. This will be carried out via my facebook page and my blog so keep an eye out! 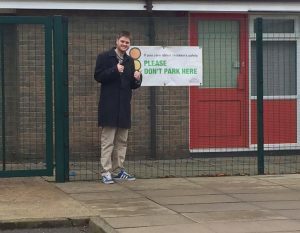 This entry was posted in Cambridgeshire, Campaigns, Community, Council, Environment, Features, Gossip, News, Transport and tagged City Council, Cllr Andrew Bond, Education, FEATURED, Lib Dem, Liberal Democrats, Parking, peterborough, schools. Bookmark the permalink. ← How much extra are you paying for Brown Bin collection ?